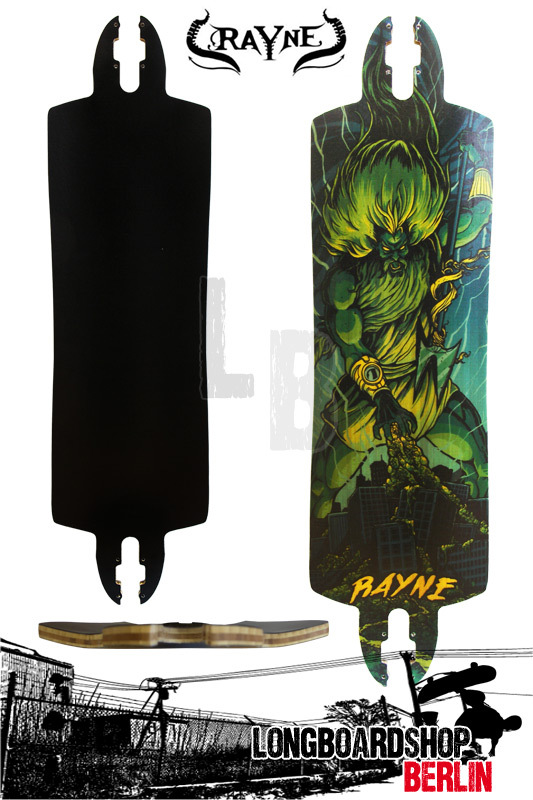 Rayne Killswitch 37.25" Top-Mount VersionRayne Nemesis 39"
The Killswitch says it all. The brainchild of Kevin "K-Rimes" Reimer is finally out and ready to steal your time, your urethane, and your minds. With years of experience riding downhill and a sharp mind, Kevin has taken the time to think about each and every movement you make when riding downhill, and how a board could make those manoeuvres easier through being positively "locked in". Ergonomics were the name of the game when this board came to be and it stickhandle’s through the competition better than Gretzky ever could. 2: K-Rimes' own Pleasure Dome - concave with a subtle feel that is enough to lock you in, but not enough to become bothersome on long bombs or pushes. The W concave also allows for butter toe-side pre-drifts and heel-side stand up checks by keeping your rear foot in place. 4: Three-dimensional wood bending: used in this deck to give a full, cupped feeling for the front and rear toes. This allows the body to lean far away from the board while still maintaining full contact of the front foot. The rear foot will find a pocket specially designed for those who tuck, and tuck fast. 5: The "Drop-Lock". When you stand on this deck your front foot will naturally position itself into the "Drop-Lock" where the toes sit beside the drop rather than behind it. This makes for a complete and total lock of the front foot for toe-side drifts. Pleasure Dome Arch Support - Get connected! Arch support will dial in your steezy cornering by giving you full contact with the board. Universal Drop Thru Mounting - (Optional) Lowers your board for easy pushing and extra stability. Universal Variable Top Mounting - (Optional) Lets you pick the wheelbase that works best for you. Leverage Concave - Grips from the ball of the foot to the center of your heel for outstanding turn control.